April 01, 2014 Culture » Big Shiny Robot! I like to think it’s my job when writing this column to point you toward comic books and other nerdery that you might otherwise never hear about. The Image Comics series A Voice in the Dark qualifies as a well-executed curiosity that you’ve probably never heard of, but should seek out. A Voice in the Dark is an original comic series written and drawn by a man named Larime Taylor. It’s a grayscale book with a diverse cast of female characters, and it harbors a dark side. The main character, Zoey Aarons—a brilliant studio and radio DJ—has murdered someone and gotten away with it. She works hard to keep her secret, but can’t stop fantasizing about murdering again. Zoey is having a breakdown, and decides she’s going to use her slot on the school radio station to help others with their problems, too. Aside from that single quirk—because we can safely call being a potential serial killer a “quirk,” right?—Zoey’s a completely normal, socially awkward young woman. The entire female cast is written with a realistic insight I wouldn’t have imagined possible from a male writer, but Taylor has escaped all of the usual gender-bias traps and given us something unique. His artwork is clean and realistic, almost to an eerie degree. The line work is strong, and none of the women in the book are of the stereotypical “comic-book heroine” proportions. Everyone in the book feels like a real person—not just in the writing, but in the visual representation as well. The grayscale palette of the book offers a world where morality doesn’t come in simple black & white. It’s an interesting mixture, carefully balancing college life, family life and the interior life of a girl ready to murder again at a moment’s notice, which is never something I’d expect to see. More than that, Zoey—despite clearly possessing a killer’s instinct—is likable. I want her to succeed in what she’s doing, whether that’s getting away with a murder or committing a new one. And there’s something that makes this book even more remarkable: Every line of this comic was drawn, and every word was written, with the artist’s mouth. You see, Larime Taylor was born with arthrogryposis, a congenital defect that allows him little use of his arms and legs. He uses a digital tablet (that was been generously donated by Wacom) and a pen in his mouth to create the images you see in the comic. A comic book this well-written and capably drawn is an achievement for any creator, but the tenacity required to launch a comic book you drew with a pencil between your teeth is nothing short of amazing. Two years ago, Taylor launched a Kickstarter to publish the book—originally titled Dark Zoey—himself, and it worked; he raised almost $10,000. 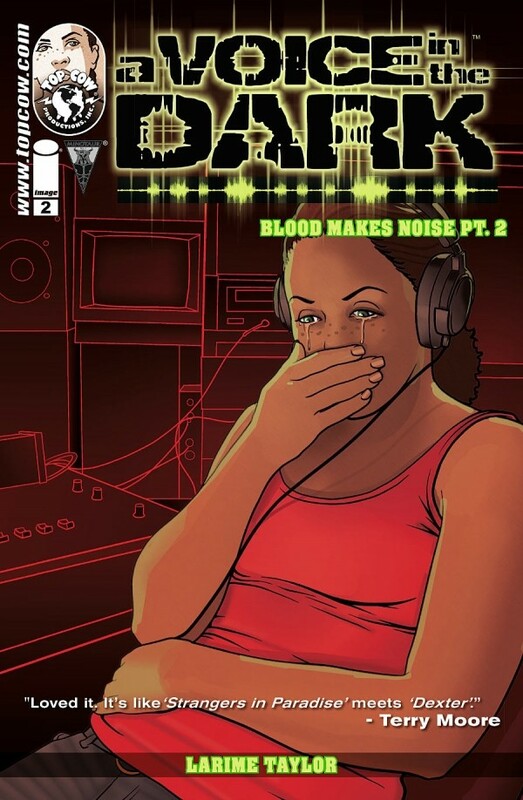 First published under Taylor’s own Gimp Comics, A Voice in the Dark ultimately drew the attention of the Image Comics imprint Top Cow. Five issues have been released so far, but the sixth and seventh might be his last. Despite the incredible writing and art, and the inspirational story behind its creator, sales of A Voice in the Dark are not as strong as they should be. So, do yourself (and Taylor) a favor and order a copy of A Voice in the Dark.